One mistake even experienced designers make is turning chairs away from the sofa, which makes conversation awkward when hosting. 1. Place the sofa and chairs so that they’re facing each other. 2. Keep seating in close proximity. “Close” shouldn’t compromise anyone’s personal space, though “You want to leave about two feet between chairs, and two feet from the sofa to the coffee table,” De Arias says. “Everything should be within an arm’s reach.” You should be able to reach for an hors d’oeuvre on the table without a lot of stretching. 3. Avoid putting all the furniture against the perimeter of the room. “It’s unappealing,” De Arias says. “Too much separation between seating spaces discourages conversation and kills the room’s warmth and harmonious flow.” That doesn’t mean avoiding all the walls. 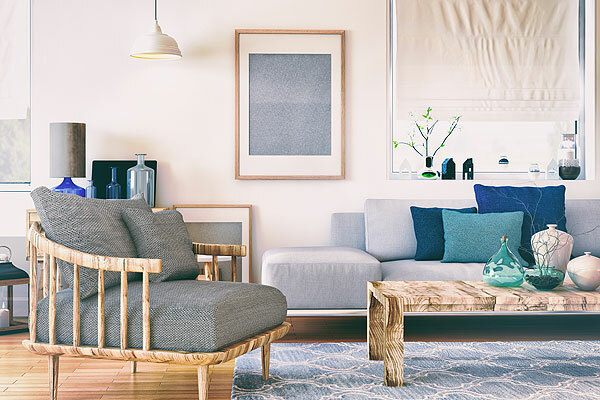 If, for example, you put the sofa against a wall, place the armchairs and side tables in the middle of the room, which will create a more natural, well-balanced look. 4. Don’t go overboard with throw pillows. Two or three pillows for a medium-size couch is attractive; more than that is awkward. A profusion of pillows may perplex someone: Should the move the pillows so they can sit and chat with a person sitting in an armchair? If so, where are they supposed to put them? 5. Bring on the bulbs. To promote conversation, it’s essential to light the space properly. “Lighting affects everything – the room’s ambiance, its look and its appeal,” De Arias says. “But it shouldn’t be so bright that it bothers people.” Instead of installing high-wattage bulbs in a light source, use a 40- or 60-watt bulb for a soft, warm glow. 6. Make the living-room entrance welcoming.